While we may be seeing greater convergence in their overall design, emojis still have variations in their appearance across platforms that can significantly alter their tone and personality. 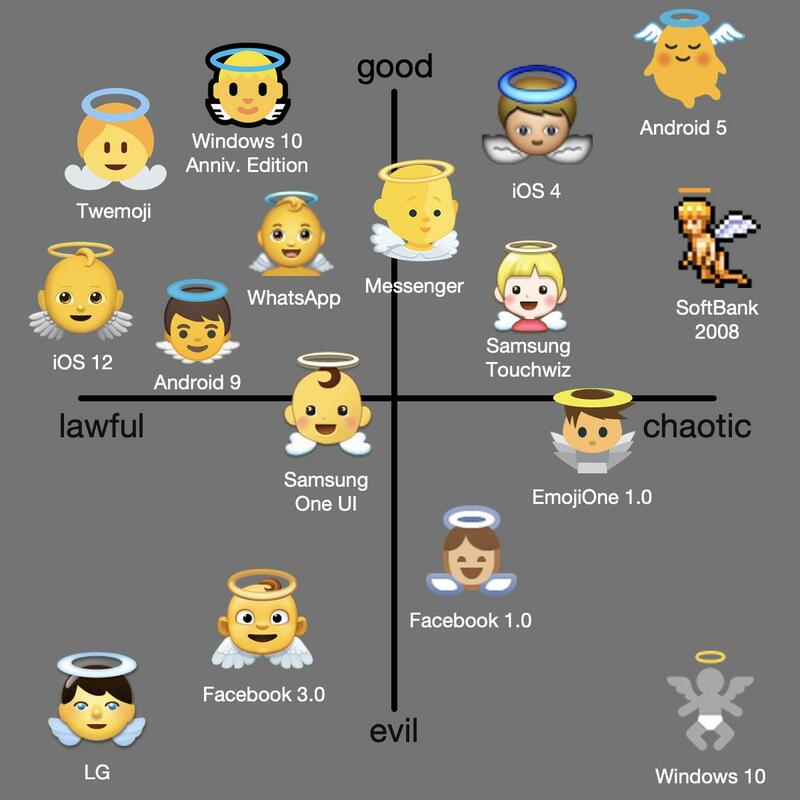 In a playful exercise earlier this month, we analyzed the temperament of two such emojis—👼 Baby Angel and 👿 Angry Face With Horns—using a Dungeons & Dragons (D&D) alignment chart, which morally orients characters in the game on axes of good vs. evil and lawful vs. chaotic. Thanks to its guileless visage, we graded Twitter’s 👼 Baby Angel as lawful good, as might describe a noble knight in D&D. The menacing mug of Facebook’s 👿 Angry Face With Horns, meanwhile, positioned it as a little lawful but extremely evil, as is true of some devils in the tabletop, role-playing game. Indeed, 👿 Angry Face With Horns is commonly called Devil. 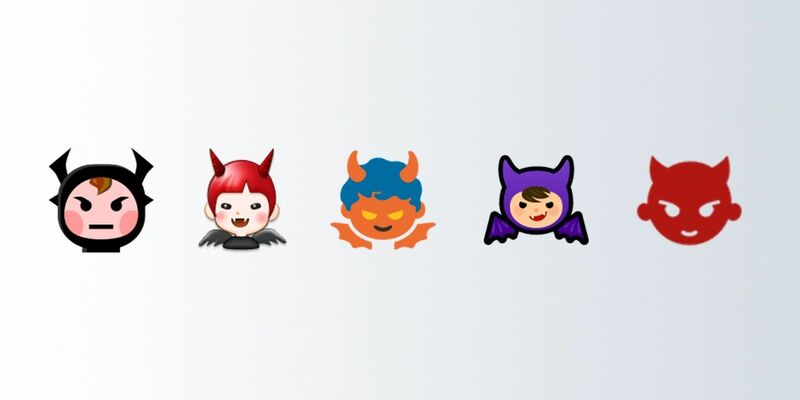 But, as they say, the devil’s in the details: This emoji’s official Unicode name is actually Imp. It's time for mythology to meet Emojiology. Generally depicted as a scowling, purple face with devil horns, 👿 Angry Face With Horns is commonly used to represent devils, devilish behavior, ideas of evil, and various feelings of anger and frustration. 👿 Angry Face With Horns was added to the Unicode standard in 2010, but had been bedeviling Japanese keyboards as early as 1999. That year, SoftBank featured the full form of a small demon, blue in hue with a tail, bat-like wings, and two, long, horn-like ears over a red mouth. Another early Japanese iteration, from au by KDDI in 2002, shows a creature with lopsided ears wielding what might be a pitchfork or staff. 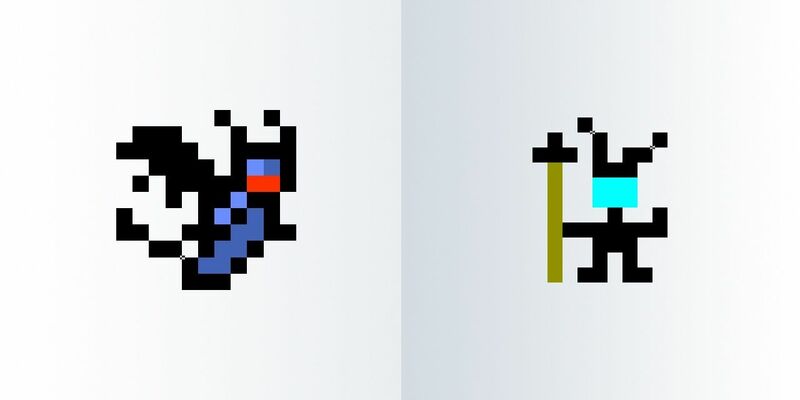 In both designs, we can almost hear the wee fiend laughing shrilly and maniacally, as if plotting a prank: “Nah-heh-heh-heh-heh-heh!” And, both designs aptly suggest its Unicode namesake: an imp. 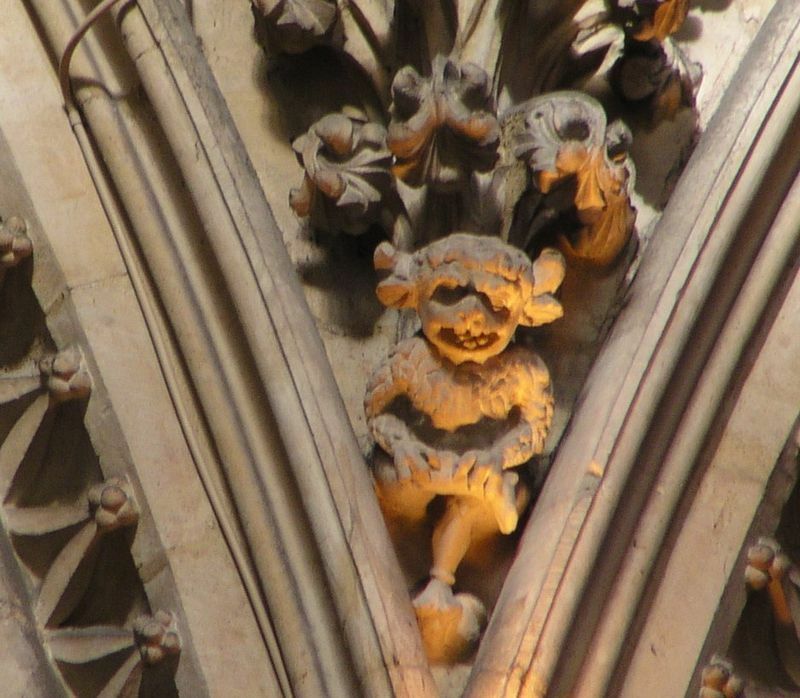 The folklore of many cultures, especially in Europe, told of imps, or little demons that caused mischief. (Other emojis based on folklore include 👹 Ogre and 👺 Goblin, both based on mythical creatures in Japanese tradition). These tiny tricksters—often grotesque-looking creatures with wings and horns, as SoftBank and au by KDDI originally depicted—were fabled to attend on witches or the devil, e.g., an imp of Satan. Etymology, here, is instructive. In Old English, an imp was the “young shoot” or “scion” of a plant or tree. The word was applied to a “child” by the 1300s, specifically of evil beings by the 1500s, i.e., a “child” of the devil, and metaphorically extended to a “mischievous child’” by the 1600s—a sort of Dennis the Menace of the early modern world. Many early forms of 👿 Angry Face With Horns, including from Google, Microsoft, and Samsung, portrayed a youthful face that was winged, horned, and sometimes fanged. More adorably, SoftBank and au by KDDI suggested a child dressed up as a demon, as Max from Maurice Sendak’s Where the Wild Things Are swapped out his wolf suit for his rumpus. 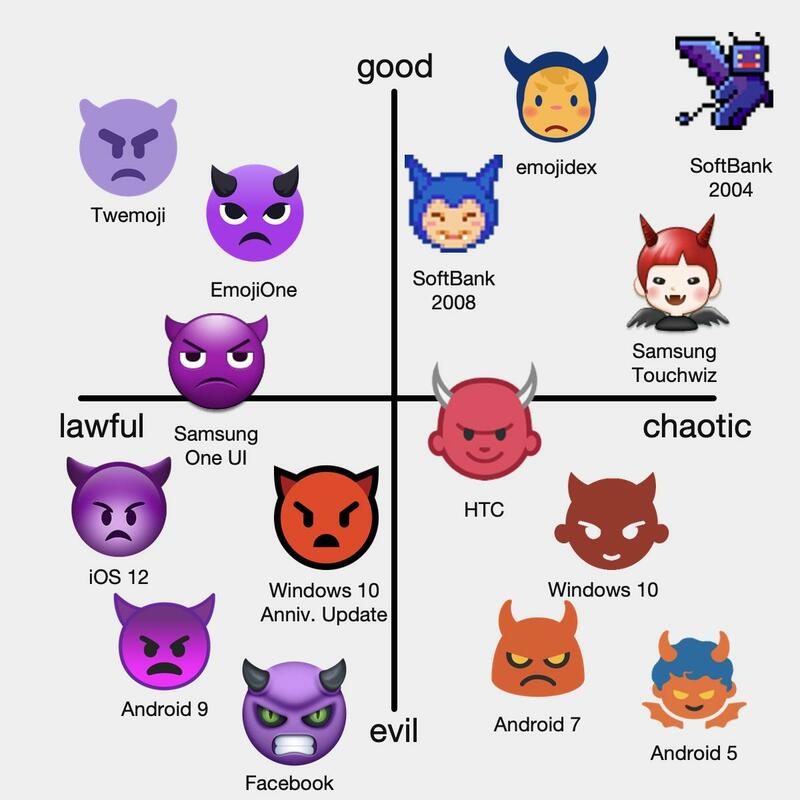 As ever, Apple’s 👿 Angry Face With Horns, essentially unchanged since its original 2008 implementation under iOS 2.2, has led the way in how the emoji now displays across major platforms. Its purple face bears the same expression as its 😠 Angry Face and 😡 Pouting Face: a frowning mouth and eyes with eyebrows scrunched downward in anger. 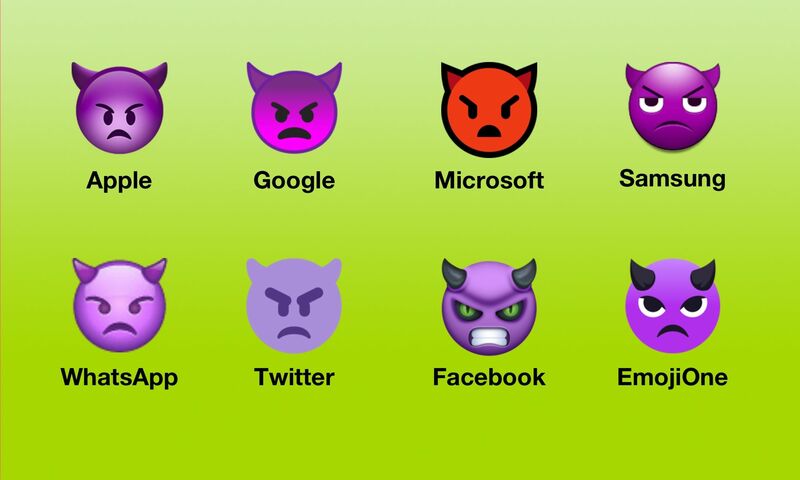 Microsoft’s design is colored a classic devil red while Facebook’s is more realistic—and more evil, with glowing, green eyes, black horns, and gritted teeth. 👿 Angry Face With Horns often represents or evokes devils, demons, and other such supernatural beings in art and culture, especially around Halloween. The glowering expression of 👿 Angry Face With Horns lends it great emotional power, too. Some users employ it to vent their spleens, whether just irritated or fully irate. Others take to 👿 Angry Face With Horns to register displeasure or disgust, sometimes even going as far as characterizing something as evil. 👿 Angry Face With Horns is not to be confused with its more mischievous counterpart, Smiling Face With Horns, though the two both often signify devils or devilish behavior. Like 👿 Angry Face With Horns, 😈 Smiling Face With Horns has a purple face, horns, and angry eyes. Its smile, however, is more playful and suggestive. 👿 Angry Face With Horns can be used to similar emotional effect as 😠 Angry Face, 😡 Pouting Face, and other furious-featured emojis to express a range of negative feelings. Due to its devilish character, its tone, in these contexts, can be more spiteful than its other, irked kin.